With chants of "I say robot, you say no-bot! 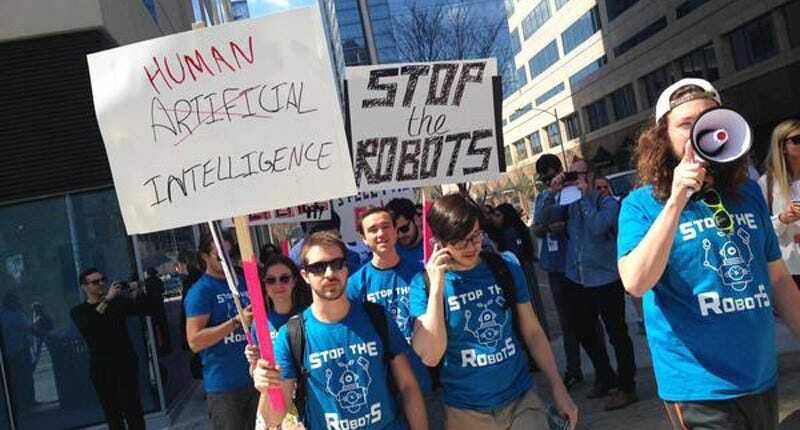 ", a group of protesters took to the streets in Austin, Texas to warn against the rise of artificial intelligence. The movement, though small in number, may be the start of a larger trend. As reported in USA Today, yesterday's march took place just outside the Convention Center entrance of the South By Southwest culture and technology festival. The protest, organized by computer engineer Adam Mason, involved some two dozen activists. "This is about morality in computing," Mason told USA Today. Photo: Jon Swartz, USA Today. The protesters held up signs adorned with such slogans as: "Stop the robots," and "Humans are the future." Chants included, "A-I, say goodbye!" and "I say robot, you say no-bot!" Many of the protesters wore blue t-shirts with the inscription, "Stop the robots." Many of the activists were from the University of Texas, which hosts a strong engineering program. As noted by Mason, it's a movement that's deeply concerned about the fate of a society where artificial intelligence is granted too much control, adding that "Planes can fly themselves, but the person who is ultimately responsible for landing a plane is a human." It's a sentiment that closely mirrors the concerns of Stephen Hawking, Elon Musk, and many others who have recently spoken out about the potential risks stemming from AI. Libin added that we should be more worried about other humans.